Well, it’s late in coming, but we have a cookie. 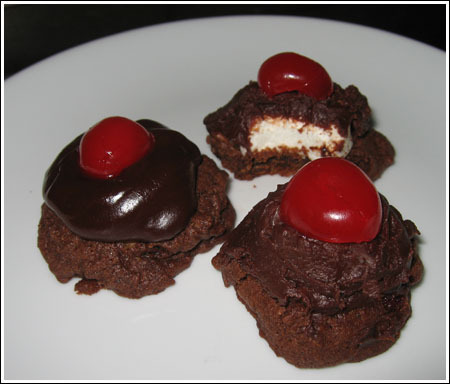 These are called Aunt Ann’s Chocolate Sundae Cookies and they’re made with a very old and very famous recipe. 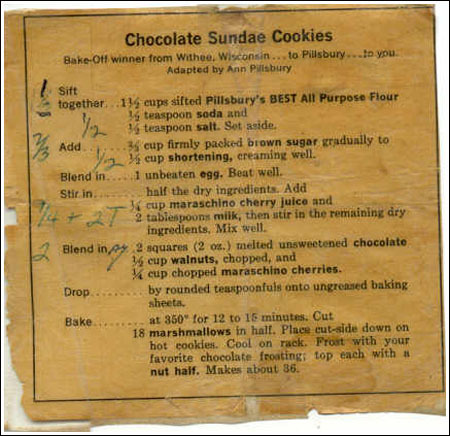 My grandmother, now 89, cut out this recipe from either a newspaper or magazine way back when. Last year she gave me the clipping. It’s all yellowed and she used some kind of tape to laminate it. It’s quite a treasure. At some point, I’m sure as her eyesight became less acute, she wrote the measurements down in her own handwriting beside the original amounts. I’m guessing this helped her to see it better. My grandma made these every year for us. It wouldn’t have been a holiday cookie tray at our house without them. Sue, thanks for the recipe. This is definitely a treasure. I’ve pasted a cleaner version below and added a couple of glaze recipes. I tried them both and prefer the shiny one. Softened canned frosting would work too. Stir together flour, soda and salt, set aside (these are the “dry ingredients”). With an electric mixer, beat brown sugar, shortening, egg and vanilla until well blended. Add melted unsweetened chocolate and mix well. Add dry ingredients and stir until mixed, then stir in milk, cherry juice, cherries, nuts and mix until well blended. Drop by teaspoon onto cookie sheets and bake at 350 degrees for 12 minutes. As soon as the cookies come out of the oven, press a “Jet-Puffed” marshmallow in the center. Let the cookies sit on cookie sheet until sturdy enough to transfer, then move to a wire rack. Spoon glaze over marshmallow, covering it completely. Cap with a stemmed cherry or cherry half. If you like canned frosting, you can use that. Soften it in the microwave for 20 seconds, stir, and spoon over top. Otherwise, make your own glaze. I tried two. This one started to set quickly and had a sour cream twanginess. It was good. Melt chocolate chips with the butter, then add sour cream and vanilla. Add powdered sugar and beat well. In a heavy saucepan, melt butter. When butter is partially melted, stir in chocolate and corn syrup. Stir until smooth. Remove from heat and stir in vanilla. I made some modifications to the directions so that they are more clear. Mix dry ingredients (flour, soda, salt) first and set aside. Add dry ingredients, followed by milk, cherry juice, etc. I’m a little confused by your recipe. Do you add the dry ingredients with milk/cherry juice/cherries in a separate bowl, then add to the shotening mixture? Or do you add the milk/cherry mixture to the shortening mixture, then add the dry ingredients? Oh…by the way….a few years back, I froze some of these. I ate them before a few months passed, and they were great. I think making sure they were not overbaked….helped. I am making these today. They were always a family favorite at Chritmas. I made them this past Xmas, and the recipe I had of my Mom’s ( who died April, 2007 ) was a bit tattered and part of it was not there…ha. I am so glad I found the EXACT recipe here! I add a bit more cherries, and I up the amount of unsweetened chocolate a little. I like that it makes it a richer chocolate. I also make sure to bring them out just a wee bit earlier than recommended. This way, they stay softer, longer. For the chocolate top, my Mom always just melted semi-sweet choc chips and a bit of shortening in a double boiler. I have always liked them that way. Thanks for the back-up recipe! Kelley, I emailed you a reply. Hope it helps! I’ll have to pull one out and see what it looks like after being frozen, I’m worried the cherries will seep and the icing with crack 🙁 time will tell !! ha! I’m glad you liked the cookies. Please let us know what you think of them after being frozen. also, the recipe is perfect! I think I like it when you can see a bit of the marshmellos it looks like ice cream! also, I think they provide more contrast when you see the white. I’m freezing my 1st layer now, and hoping for the best. I made these cookies and they are just starting to dry, can these be frozen for christmas? How long does it take for the icing to dry ? Can you stack them? how are they stored?? Sorry your cookie was a bit too crumbly. It sounds like maybe you used a bit too much flour. Did you scoop it rather than spoon and gently sweep? Too much flour or too little liquid would result in a dry and crumbly cookies. Or you might have overbaked it. Just so you know, the bottom part of the cookie (the cookie part!) is supposed to on the dry side. Not unpleasantly dry and crumbly, but soft and cakey/dry so that’s it’s a relief to the rich chocolate glaze. I’d try the cookie part again. Hi — we made these last night and loved the recipe. It went together fast and easy for a lovely treat before bed. The cookie part turned out really dry and crumbly for me — any idea what I did wrong? I baked the set time and the cookie was still soft when I pushed the marshmellow in, but when we went to eat it, it just crumbled. I made these today and they are not cookies so much as a religious experience!! A bit time consuming, but well worth it. Now I’m going to find out how they freeze if I can keep my hands off of them. I used the glaze recipe over the frosting. I found it easier to cover the marshmallow,and it also stays shiny which is nice. Many thanks Anna, Sue and Aunt Ann. 5 stars, thumbs up and A+. Baking Bites (http://bakingbites.com/) mentions this recipe in her weekly blog round-up! Those look incredible. My 8 year old cousin loved helping me make your s’mores cookies a few weeks ago, and I’ve been looking for another fun recipe to try with her over the holidays. These seem perfect! Yum – these look absolutely delicious! This look very very tasty…I will have to try them! 🙂 I love this blog because of all the great recipes! Anna, It’s nice to be someone’s “hero”! It’s interesting that Ann Pillsbury is a fictional character. I was beginning to wonder if she wasn’t someone like Betty Crocker since I couldn’t find any concrete information to go with the clipping. Anj, they do look great on a platter, and kids love them. I’m an adult and I love them, but I must admit that a lot of my love for them comes from the childhood memories associated with them. How can you go wrong with chocolate marshmallows and cherries!? Amber, I hope you end up making these. They look great on a platter. Sue, you are my hero today. Thanks for the second frosting recipe. I’m sure it will come in handy for someone….or me. Anj, I did some reading on the subject and apparently, Ann Pillsbury is a fictional character created by the Pillsbury marketing team. She’s the group identity of the test kitchen. I think it’s funny that back then, marketing teams could just *invent* people to be spokespersons. That is such a treasure. Do you think Ann Pillsbury is one of THE Pillsbury’s?? Looks like a great holiday cookie. You’re welcome for the recipe! Your cookies are as pretty as a picture. 🙂 I’m glad you tried them, and hope you like them. They’re certainly something a little different, and I think it’s fun to try these old recipes. I’d love to know exactly when this recipe came into being. My Grandma used a chocolate frosting recipe with cream cheese in it. (I don’t have the recipe, but I think it’s pretty standard.) I try something a little different every year. I think I’ll try your glaze when I make them this Christmas. Last year I found an old fashioned recipe for chocolate frosting that I tagged as working well for these cookies. Bring 1c. packed brown sugar, 1/2 c. water, and 4 T. cocoa to a boil for 3 minutes. Add 3 T. butter, and 1 t. vanilla extract. Cool slightly and add 2-3 c. confectioner’s sugar. I was hesitant to share this recipe since it didn’t come with the original recipe. Thanks for posting this recipe. I’ve been looking for something different to have this Christmas.